Figure 1. 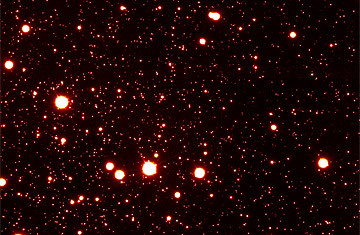 Gemini South's first light image from GeMS/GSAOI shows extreme detail in the central part of the globular star cluster NGC 288. North is up, East is right. Do Invisible Galaxies Swirl Around the Milky Way? Most people think that the Hubble Space Telescope (HST) is the most powerful stargazing system in the world. It's understandable, given the astounding images and spectacular science the instrument has been delivering since it went into full operation back in 1993. In fact, though, the Hubble is relatively puny. The mirror at its heart is just 7.9 ft. (2.4 m) across, which gives it only about one-seventeenth of the light-gathering power of the 33-ft. (10 m) twin Keck telescopes, atop Hawaii's Mauna Kea. The HST's big selling point is its super-sharp vision. Hubble orbits high above the Earth's atmosphere, a turbulent sea of constantly roiling air that makes the stars twinkle and blurs the vision of ground-based telescopes. A Keck in space would be the ideal solution  if it wouldn't be impossibly expensive to build, and if there were any way of wrestling such a gigantic piece of hardware into orbit. But there's another way: a technology known as adaptive optics (AO) can de-blur the vision of a ground-based telescope  and astronomers at the 26-ish-foot (8-ish-meter) Gemini South telescope in Chile have debuted the most powerful AO system to date. According to astronomer Francois Rigaut, who led the team that built the new hardware, its images rival the Hubble's for sharpness, and in a press release, Matt Mountain, director of the Hubble's home base, the Space Telescope Science Institute, called the image quality "incredible." Adaptive optics itself isn't a new concept, but that doesn't make it any less remarkable. The idea is to counteract distortions in the atmosphere by bouncing light off a mirror that puts an opposite distortion on what you're looking at, thus canceling out the original blur. It's as though you were looking at a funhouse mirror via an anti-funhouse mirror with exactly the opposite shape. But things are actually trickier than that. Since shifting air pockets cause the atmospheric blur to change constantly, this "opposite distortion" has to change as well. So the mirror isn't rigid: it's thin, and backed by tiny adjusters that change its shape as conditions change, many times a second. The mirror knows what adjustments to make because a small telescope nearby is always watching a bright star in the bigger telescope's field of view: since a star should always look like a perfect pinpoint of light, any deviation from that perfection tells the AO system how the atmosphere is jiggling at that moment, and the deformable mirror adjusts instantly to counter it. Unfortunately, you can't always count on finding a bright star in the direction you want to look, so AO designers now make their own: they shine a laser to bounce off sodium atoms in the upper atmosphere, creating an artificial guide star you can place pretty much anywhere. That solves one of the problems with AO. The other is that the deformable mirror corrects only blurriness relatively close to the reference star (or laser point), since atmospheric turbulence is very localized. Rigaut's team solved this one by creating five different laser guide stars and using multiple deformable mirrors in a single AO system. It's kind of Rube Goldbergian in its complexity, but it works. Impressive as AO technology is, this doesn't mean NASA should stop work on the James Webb Space Telescope, the Hubble's successor, which is slated to go into orbit in 2018. The new system sharpens only a small amount of Gemini's field of view, while JWST will have perfect vision across its entire 21-foot mirror. The Webb is also designed to work in infrared light, ideal for seeing the most distant galaxies and for spotting newborn planets around nearby stars. Infrared light doesn't get through the atmosphere very well, and no amount of de-blurring will change that. Still, the notion of producing space-sharp images from the surface of the Earth is something astronomers could barely imagine back when the Hubble first went into orbit. And for those astronomers who have to wait patiently for their turn at the oversubscribed space telescope, it's a welcome alternative. MORE: Will Budget Woes Kill NASA's Next Great Telescope?